Historic Walker Cottage. Located on East Jackson, in the heart of the Presidential streets, petite Walker Cottage offers you the chance to embrace a quiet, small town way of life. Honeyed old growth fir beadboard walls provide sanctuary, a place to relax and unwind just minutes from the ocean. Located two and a half blocks from the beach, this one-bedroom, one-bath cottage will steal your heart. Open the front door and enter the light-filled living room. Ten original mullioned windows greet you in this warm and snug room, and with the comfortable furnishings you have the best of old and new. A gas wood stove provides both heat and the pleasure of a small fire. Follow the harmonious flow from the living room to the kitchen, where new appliances make cooking a joy. Walker Cottage dates to at least 1924, and the “Dakan kitchen counter” offers one more glimpse into Cannon Beach’s past. Apparently, Mr. J. H. Dakan, a small man, built kitchen sinks and counters to suit his short stature, thereby ensuring sore backs to generations of homeowners. The present owners of Walker Cottage have raised the sink to a comfortable height, but the original low counter built by Mr. Dakan in the 1920s remains. In the small mudroom, situated just off the kitchen, you will find a washer and dryer and a back door leading into the garden. A weathered-cedar picket fence surrounds a generous lawn area, perfect for this pet-friendly home. As you continue through the kitchen, bypassing the door to the mudroom, you will enter the bathroom, updated with beautiful fir wood cabinetry. Another door leads you to the bedroom where an antique armoire and a comfortable queen bed await you. One more door completes your journey as you leave the bedroom and reenter the living room. The sofa does pull out into a sofa-sleeper, perfect for a third and fourth guest to join you if choose to share this small haven. 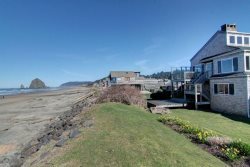 This lovely cottage, situated in a quiet, residential area of Cannon Beach, provides you the opportunity to experience the dream of living in this special place we call home.